Attending the Sensitisation Workshop on ‘Rural Infrastructure Development Fund (RIDF)’ conducted by NABARD, Arunachal Pradesh Regional Office, Itanagar for senior officials of State Govt. here today, Deputy Chief Minister, Chowna Mein said to keep provision of state share for NABARD funded schemes in the state budget from next year onward. He asked the Secretary Planning to move the file to release the state share in respect of all RIDF projects and also said to discuss the matter regarding speedy submission of DPRs with the Chief Minister on priority so that the implementations of works are not delayed as the state has short working season. He said that the people of Arunachal Pradesh have immensely benefited through RIDF by implementing various rural infrastructure development and connectivity projects and expressed his hope for all round cooperation with NABARD in future too. He expressed hope that normative allocation for the state will increase in the coming years for accelerated all round infrastructural development. He also opined that utilisation of funds under RIDF and other central sources need to be taken care of and stressed for strengthening the monitoring system to check it. He urged the departments concerned to avoid duplicity in submission of projects. Outlining the importance of agriculture & allied sector in bringing economic development of the people of the state, he urged the NABARD to increase allocation under agriculture and allied sectors as it received only a meagre allocation of 0.6%. He urged the agriculture department to gear up and prepare a road map and avail maximum benefit under RIDF by submitting proposals on irrigation projects for enhancing the production of agricultural crops. Further, he urged all the departments to come up with innovative proposals for inclusion in next year’s budget. Dr. Gyanendra Mani, General Manager, NABARD while welcoming the participants stressed on the importance of RIDF as one of the major interventions in the state by NABARD. He appreciated the State Govt.’s all inclusive budget for the current year and opined that CM’s Adarsh Gram Yojana, Kausal Vikash Yojana, District Innovation Fund as envisaged in the budget will play a pivotal role in shaping Arunachal’s economy in the coming years. He further urged the State Govt. to avail other funds announced by GOI viz. Dairy Processing Fund, Micro Irrigation Fund, Warehouse Infrastructure Development Fund, Food Processing Fund and NABARD Infrastructure Development Assistance (NIDA), etc. Dr. Joram Beda, Secretary Planning exhorted the department officials to submit DPRs on time so as to minimize the time gap between sanction and implementation of RIDF projects in the state. However, in the state of Arunachal Pradesh, the Project Completion Reports are pending for submission due to non-release of state share on time to RIDF projects. Further, he felt the need for streamlining of paper works with regard to RIDF implementation in the state and proposed to conduct separate workshops for departmental officials with a view to disseminate the flow chart for project implementation. He also felt the need for developing proper MIS system for effective monitoring of RIDF projects in the state. V.Thirumalai, DGM, NABARD gave a detailed powerpoint presentation on origin, genesis and operationalization of RIDF in the state as well as country. 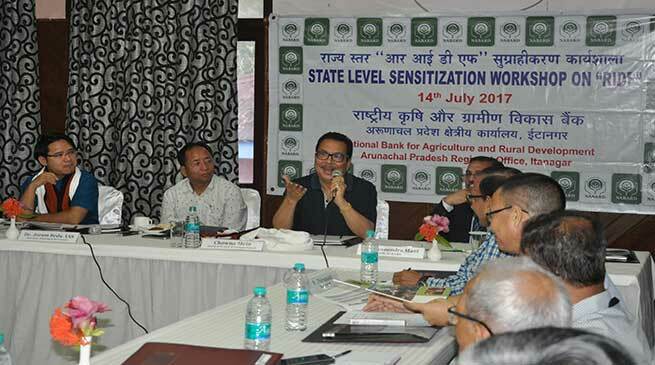 The workshop was also attended by Techi Kaso, Parliamentary Secretary for PWD & Urban Development, Ngurang Pinch, Chairman, Arunachal Pradesh Agriculture Marketing Board and Senior Officers from line departments of State Govt.